GAMES magazine began entertaining readers with its first issue in September 1977, presenting solvers with a unique blend of puzzles, articles, contests, and much more. Over the years GAMES has attracted scores of fans, many of whom remain loyal subscribers. Its sister publication, WORLD OF PUZZLES, was founded in 1994 in response to the demand for an all-puzzle publication. 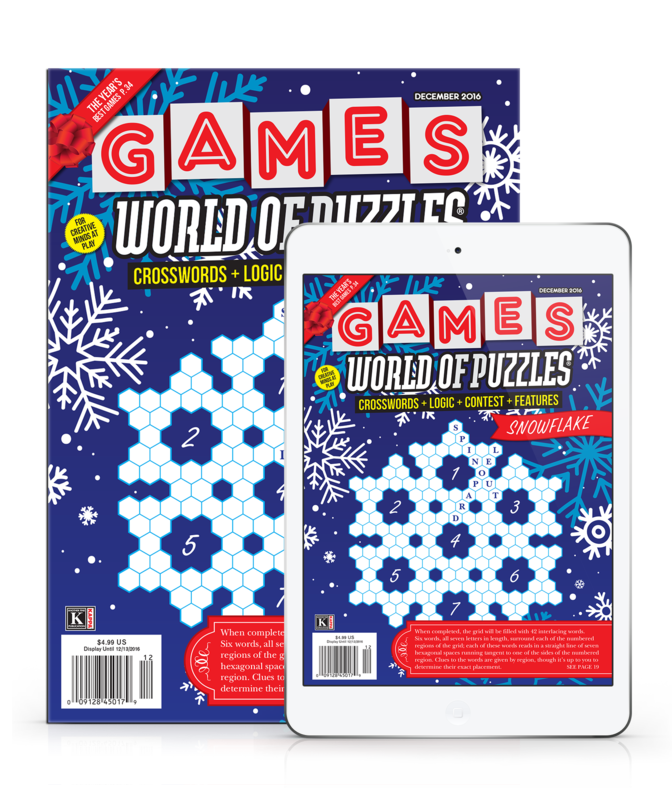 GAMES WORLD OF PUZZLES was founded in 2014 when GAMES and WORLD OF PUZZLES were merged into a single magazine. It is a high-level consumer magazine whose 80 pages offer a fun and lively mix of word and visual puzzles, brainteasers, and much more. 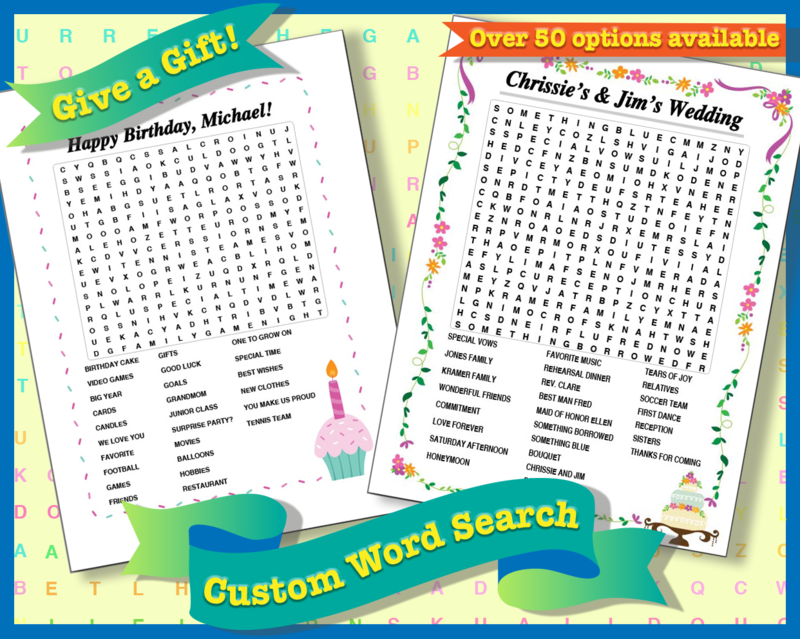 The expanded Pencilwise section features crosswords and crossword variants, Paint by Numbers, logic puzzles, and many other diversions for your solving pleasure. The 16 full-color pages include interesting and timely articles and puzzles, as well as reviews of new board games and electronic games, a calendar of upcoming events, and news from the world of games and puzzles. 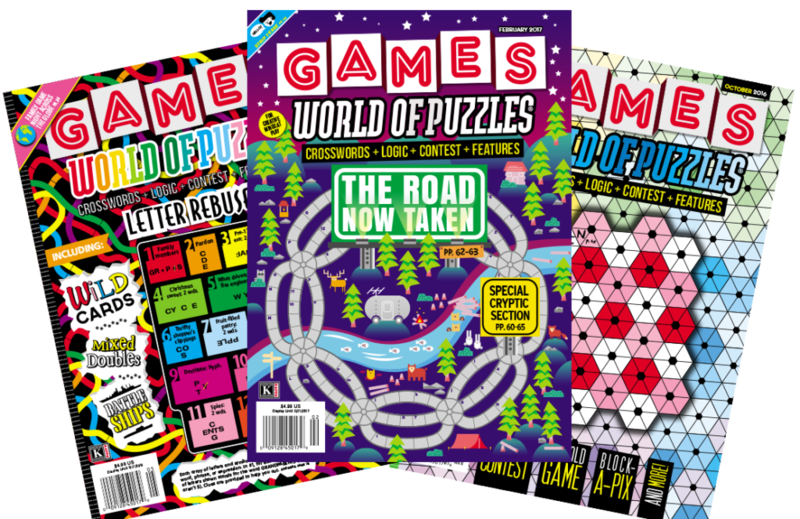 GAMES WORLD OF PUZZLES is published by Kappa Publishing Group, Inc., of Blue Bell, Pennsylvania, the leading publisher of puzzle magazines.